A figure from the article On the energy spectrum of rapidly rotating forced turbulence is selected as Image of the week on 12th November 2018 – Physics of Fluids. The article On the energy spectrum of rapidly rotating forced turbulence has been selected as Featured article in Physics of Fluids Journal (2018). A figure from the article Large-eddy simulations of turbulent thermal convection using renormalized viscosity and thermal diffusivity is featured in PRE Kaleidoscope. Mr. Rishabh Sahu received the “Proficiency Medal, Best Software Award and Bhagavatula Project Award” on the 51st Convocation at IIT Kanpur. Prof. Mahendra Verma’s book titled ‘Physics Of Buoyant Flows: From Instabilities To Turbulence’, is published by World Scientific. Image from our article “Applicability of Taylor’s hypothesis in thermally driven turbulence, R. Soc. Open Sci., 5, 172152″ is chosen as a cover image for this month’s Royal Society Open Science edition..See Here. Prof. Mahendra Verma received the Dr. A.P.J. Abdul Kalam Cray HPC award for the development of TARANG on 21st April 2018 at NIAS Bangalore. 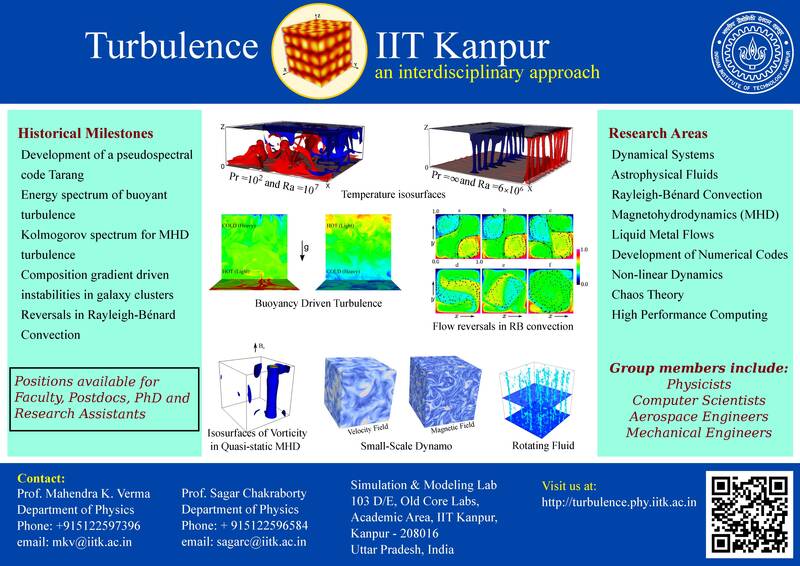 The citation reads: “Development of open-source code TARANG and using it for turbulence simulation at extreme scales”.